The family room features a beamed, cathedral ceiling, a fireplace and French doors that lead out to a deck. Karen Scrivanos Oztemel is representing the sellers of 40 Jones Park Drive in Riverside — a four-bedroom, 3,588-square-foot colonial on a 0.46-acre cul-de-sac lot. The property is listed for $2.295 million. The seller provided Greenwich Time insight into the history of the property and how it came to be her family’s home. “We were moving from southern California with two small children,” the homeowner recalled. “Our home in California was in an area where the houses were very close together and the children walked, roller skated and rode their bikes on green belt sidewalks to school, the clubhouse pool and playgrounds. As they toured the home, they came to appreciate its floor plan and features, too. The family room is dramatic, with a beamed, cathedral ceiling, another fireplace, an entire wall of built-ins and French doors that lead out to a deck. The formal dining room also offers access and flow out to the deck. 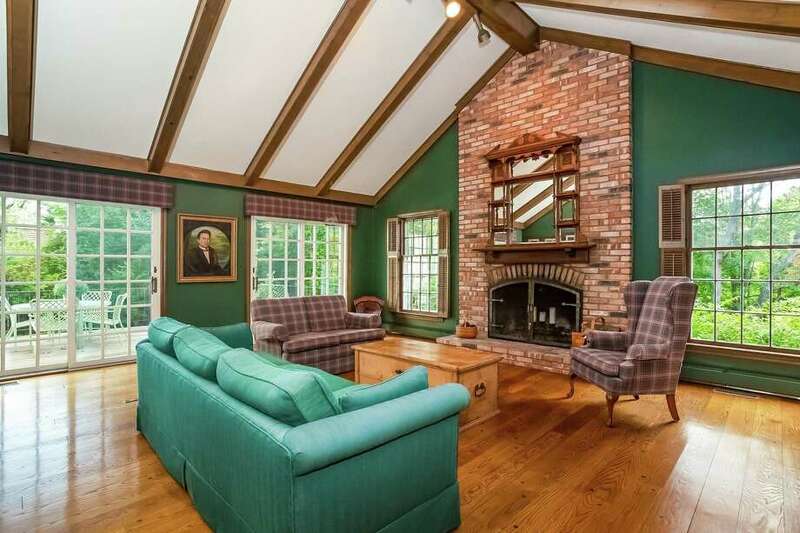 Features: Located on a 0.46-acre lot in Riverside, this 1970s-era colonial has 3,588 square feet of living space, with four bedrooms, three full baths and a powder room. The floor plan includes an entry foyer, formal living room, formal dining room, den/library, family room and eat-in kitchen. In addition to the walkout lower level, currently unfinished, the home also has a heated two-car garage. A cottage on the property has been leveraged as a guesthouse; it has a great room, kitchen and bathroom. Naturally, they wanted to make the home “their own,” so they made some improvements to the interiors, including adding paneling, wainscoting, dental molding, mantels and skylights. All four bedrooms are located on the second level. The master has an en-suite bath of its own, while the other bedrooms share two full hall baths. As sellers, they are passing along a home that offers a simple classicism and plenty of opportunity to update and decorate according to the buyer’s lifestyle needs and design tastes. For example, the home’s walkout lower level is currently unfinished, so it’s open to interpretation for its next residents. Another special attribute of this property is its outbuilding, a quaint log-style cabin privately situated and removed from the main house. Known as the “Jones Family Cottage,” it has some historic significance and local lore attached. It’s the homeowner’s understanding that off and on over the years since, the cabin had been used as a guesthouse. “It is very rustic, with one large room, a small kitchen and a bath,” she said. The backyard is level and feels private thanks to a mature perimeter of trees and shrubbery. The neighborhood is known for its sledding slopes when snow falls on Greenwich, the seller noted.